Ses Salines: APARTMENT RURAL MALLORCAN FINCA WITH POOL AND 5 MINUTES FROM THE BEACH TRENC. SES SALINES. The "Finca Es Torrent den Cosme" is strategically located in the southern cone of the island of Mallorca and in the center of the main virgin beaches and coves of Mallorca which is no more than 10 minutes by car, and 350 m from the center urban of ses Salines. This house has all the amenities, satellite TV, air conditioning, washing machine, refrigerator, microwave, ... and free WIFI. The access is easy and by an asphalted road. 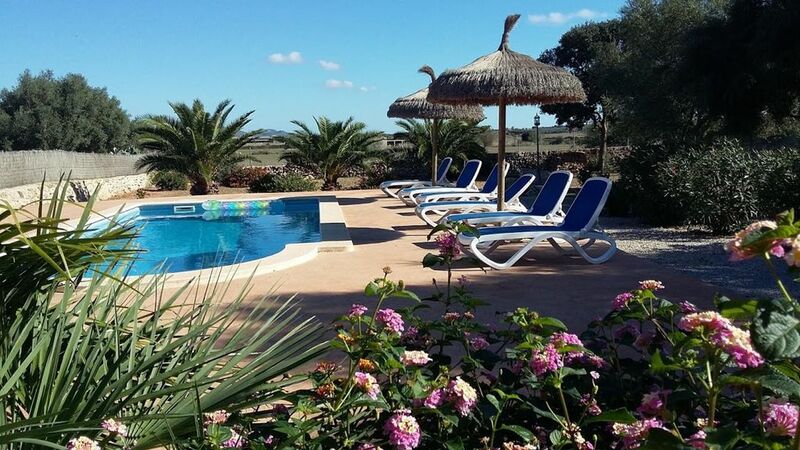 The farm is on a plot of 4000 m2, and has a pool of 4 x 9 m, with a solarium of 150 m2 prepared with sun beds and umbrellas to relax and sunbathe at any time of day. The pool is shared with the attached house. The garden has a harmonious layout with a beautiful landscape of palm trees, shrubs, olive trees and lemon trees, offering total relaxation on the outskirts of Ses Salines village, enjoying the inner horizon with stunning views of the San Salvador mountain. It is remarkable the velarium, from May to September, to protect against the sun in the summer and enjoy readings, meals, dinners and family chats. The farm also has a charcoal barbecue to make all kinds of roasts. Another great advantage is the supply of spring water from the land of the farm. In addition, the property is fenced and has parking. The house has a maximum capacity of 4 people, with a double bed of 150 cm and two single beds of 90 cm, in two rooms. In addition, a bathroom with shower, living room and fully equipped kitchen. First of all, for its quiet environment away from the hustle and bustle. On the other hand, for its complete equipment Third, because this product we offer has an excellent quality price ratio. We have a very competitive price on the island of Mallorca and offer excellent value for money. Thus, the average price of a family house in Mallorca for 4 people with a pool and with our quality or even lower than ours in most cases in the form of equipment and services in the accommodation is € 200 / day. In our price is included accommodation, electricity, hot and cold water, gas, bed linen, bath and pool towels, tea towels and all appliances (fridge, microwave, dishwasher, toaster, coffee maker ...) and connection Wi-Fi free. Also bed and high chair, if necessary. The air conditioning is not included. This was the second time we had visited the area, which we love, and we stayed in the single storey apartment attached to the house which is rented separately. The accommodation is fine, simple and comfortable. The kitchen has just enough to be able to cook in the evenings though the BBQ makes it more enjoyable. The outdoor table and chairs under an awning is lovely in the evenings, and the pool was quite an asset as the weather was too hot for the beach in the afternoons. Fernando looked after us well and takes pride in keeping the property in good condition, even sweeping up after a particularly bad dusty rainfall. We really have only one small point to make: there were absolutely no cleaning materials for the kitchen or bathroom which for a travelling visitor would have been very useful. Would definitely recommend Finca Es Torrent. Fernando and Esperanza were two of the most welcoming, hospitable and professional holiday home owners we have ever known. Their accommodation was incredible; clean, well facilitated, secure for the children and other valuables (passports, cameras etc), luxurious, tranquil and all with stunning views all around us. Everything we needed was nearby, including a lovely town (Ses Salines; a true piece of Mallorca) and paradise beaches. We all loved it so much we booked up for a longer holiday the following year. Die beste Villa in Ses Salines. Wir hatten einen schönen Aufenthalt und wären gerne länger geblieben. Das Haus war sehr schön, mit schönen Außenbereichen, um zu sitzen und sich zu entspannen und die Aussicht zu genießen. Wir fanden das Haus sehr entspannend und hatten alles was wir brauchten. Gracias Sabrina y familia. Nos vemos el año que viene !!!! Schönes Anwesen in einem charmanten Dorf. Sehr geehrte Touristen. Unser Aufenthalt war unglaublich. Es hat viel Sauberkeit, es hat eine ausgezeichnete Lage für Ihre Familie. Die Familie, die es vermietet, ist wirklich charmant und hat eine Verfügbarkeit von 25 Stunden pro Tag, falls Sie sie brauchen. Es lohnt sich sehr. Wir werden ohne zu zögern zurückkehren. Wir waren begeistert von der Unterkunft und den Einrichtungen, und wir würden das Haus auf jeden Fall jedem empfehlen, der in dieser Gegend bleiben möchte. Ausgezeichnete Lage Das Haus war sauber und gut ausgestattet und die Kinder waren sehr glücklich im Pool. Es gibt Geschäfte / Restaurants in der Nähe, sowie der Strand. Wir würden nicht zögern, wieder zu buchen. The village of Ses Salines is known for its tranquility and authenticity, and is a wonderful alternative for tourists who want to enjoy the beaches and natural surroundings in the south of the island, but escaping the hustle and bustle of the resorts . Ses Salines has everything you need: supermarkets, banks, pharmacy, meat, fish, steak houses (La Fusteria) in fish and famous for its tapas and seafood dishes (Casa Manolo), in Mediterranean food (Cassai) in Argentine barbecue (theater) or bar terrace with access to the Internet (Llum of salt).